Amilkar Ariza has created a magnificent and stunning collection of bronze sculptures which have become his specialty. He possesses an unprecedented ability to capture and illustrate the expressions and movements of the human body. The series "The Golfers" which was inspired by the artist's passion for the sport, consists of 10 bronze sculptures. These magnificent pieces capture their admirer's attention by transforming them emotionally into the actual experience of the game. A fan of many sports, Ariza has created yet another limited series in bronze sculptures than includes the game of Baseball, Basketball and Tennis. sensibilities of the woman, is again another example of this artist's genius. 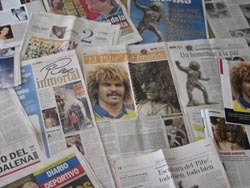 The last 4 years, Master Ariza is dedicated to became "the sculptor of the Major leagues", creating beautiful sculptures of many baseball movements. 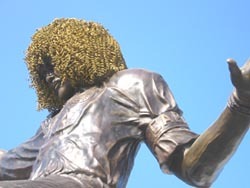 Recently, Master Ariza has created monumental Bronze sculptures. 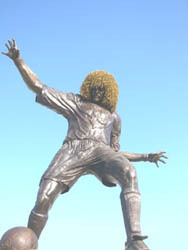 The most important one, was the monument to colombian soccer player, Carlos "El Pibe" Valderrama". 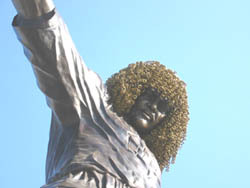 A 22 feet tall sculpture in one of the most characteristic movements of this master player. 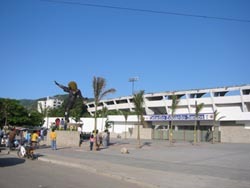 The sculpture was placed in front of El Pibe's home town stadium, in Santa Marta - Colombia.